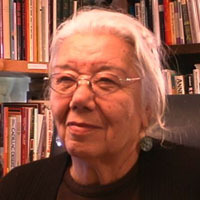 Ms. Cook-Lynn, M.A., is an author and Professor Emerita of English and Native American Studies at Eastern Washington University in Cheney, WA. She has taught high school in New Mexico and South Dakota and was a fellow for the National Endowment of the Humanities at Stanford University in 1976. Since her retirement from Eastern Washington in 1990, she has served as writer-in-residence at universities throughout the United States.